Arlington National Cemetery, VA – As thousands of volunteers fanned out here this weekend, placing holiday wreaths at the white headstones as part of the “Wreaths Across America” tribute, Sheila Patton kept vigil at one particular grave site. 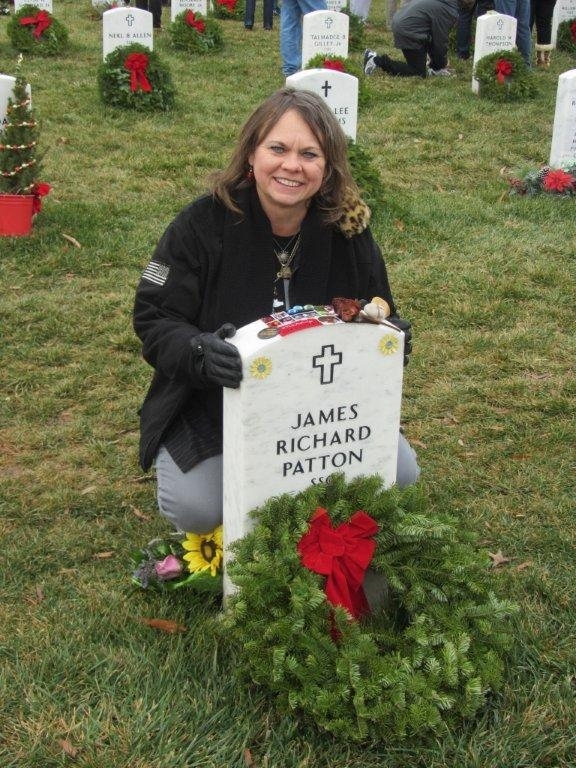 Patton and her daughter stationed themselves at the grave of their son and brother, Army Staff Sgt. James R. Patton. Twenty-three-year-old “Jimmy” was serving his seventh overseas deployment since 9/11 with the 3rd Battalion, 75th Ranger Regiment, when he was killed in a helicopter crash in Tikrit, Iraq, on April 18th, 2010. Patton said she travels here from Fort Campbell, KY, as often as possible. 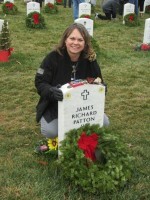 Patton felt a special calling, she said, to participate in the largest single venue of the nationwide “Wreaths Across America” tribute. Fort Campbell, KY – Just seven months after her 23-year-old son was killed in a helicopter crash in Iraq, and with three months left before her husband returns from his deployment to Afghanistan, Sheila Patton isn’t facing the holidays feeling sorry for herself. Instead, she’s found a calling: helping to bring inspiration and hope to families of fallen soldiers at this post that’s suffered a heavy toll in combat losses since the September 11th, 2001, terror attacks. Patton, the wife of Army Command Sgt. Major Gregory Patton, command sergeant major for the 101st Airborne Division’s 3rd Brigade Combat Team, feels the pain of her son’s death as if it had happened yesterday.